This better "tunafish" sandwich has all the great texture and taste of this classic sandwich without any animal products. 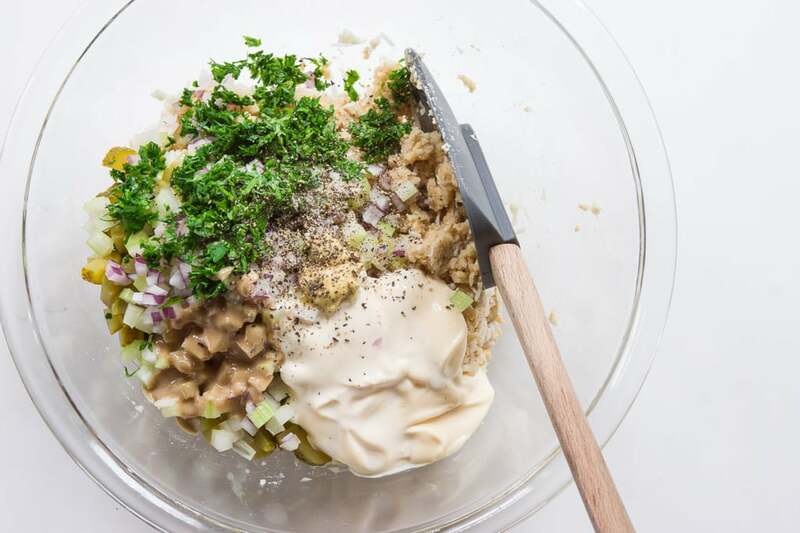 Whether you're vegan or not, this combination of crisp onions and celery with coconut and chick peas makes for a delicious guilt-free lunch that I'd argue tastes better than the original tunafish sandwich. With the holidays mostly over, and the new year just around the corner, I’m guessing more than a few of you are thinking about your resolutions for the new year. If eating healthier, reducing your reliance on animal products, or bringing lunch from home is on that list, I have the perfect sandwich for you! While one could make the case that this is better for the planet and better for you, the “better” in this Better “Tunafish” Sandwich doesn’t have anything to do with either of those things. I gave it the name because I think it tastes better than one that’s actually made with canned tuna. To explain that, I should first give you some background. I’ve never liked tuna salad sandwiches. If given the choice I’d choose an egg salad or chicken salad sandwich any day, and if I wasn’t, I might just opt to skip lunch that day. It’s not that I have anything against canned tuna, it’s a great pantry staple that can step up in a pinch, providing protein for a pasta or umami for a salad. But for some reason, the combination of the canned tuna and mayonnaise has never appealed to me. At best, these sandwiches remind me of canned cat food, and at worst, they smell like… Well, I’ll leave that to your imagination. 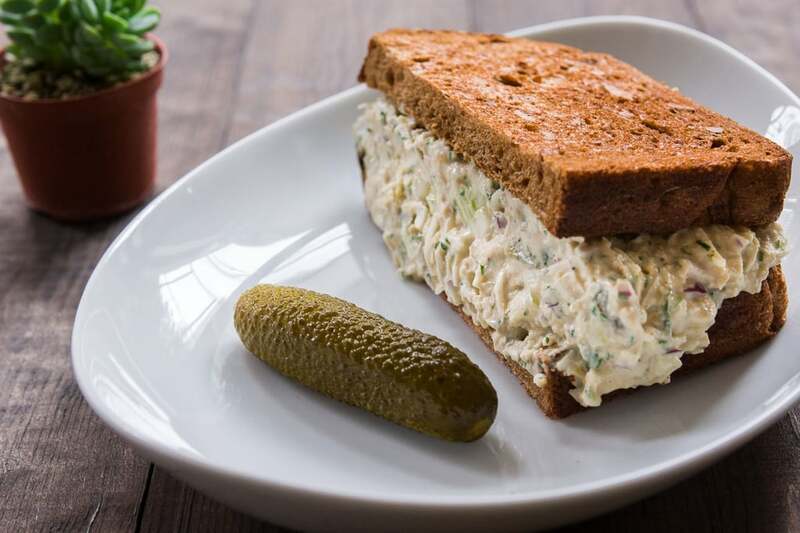 With a fun array of texture and boatloads of umami, I’ve always thought that a tuna sandwich would be pretty good if only there was a way to get rid of the smell. That’s why I’d always have high hopes for fishless vegan takes on this classic. Unfortunately, these plant-based variants almost always rely heavily on seeds, nuts and legumes, with a texture and taste that’s nothing like the original. Convinced I could do better, I started to think about how to make this happen, and I started with the texture of canned tuna. For me, tunafish has a dry fibrous texture, that eventually gives way to a rough paste as you chew through the fibers. Rummaging through the pantry, I skipped past the typical seeds, grains and nuts, but then stopped when I came across a bag of shredded coconut. Coconut definitely has a dry fibrous texture, but in its dried state it’s a bit too tough. Wondering if rehydrating it would change that, I added some to a pot with water and cooked it. 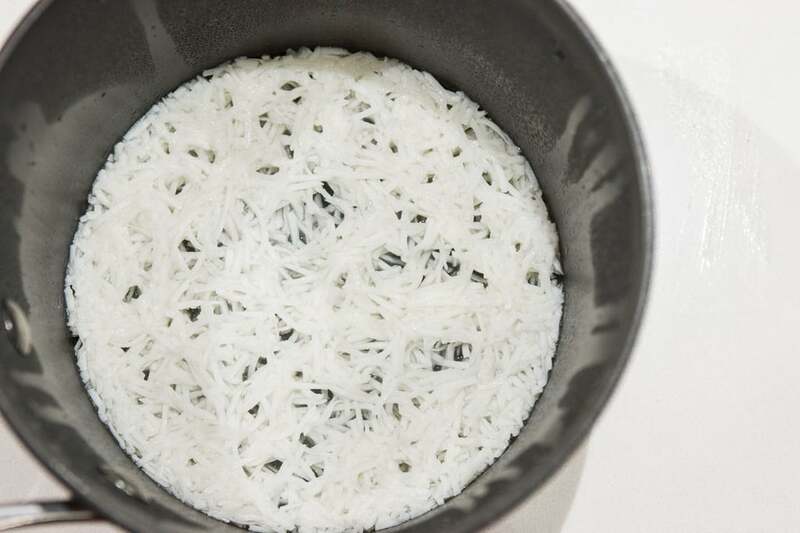 After about 30 minutes, the texture of my finely shredded coconut started to resemble canned tuna, but it still lacked the ability to turn into a thick paste as you chew. For that, I decided to go with some lightly mashed chickpeas. Together they had a texture and color that was pretty close, and as an added bonus, chickpeas have a reasonable high level of umami producing glutamic acids. As for the taste, canned tuna is loaded with umami and has a flavor that’s musty, nutty, and… well… fishy. My goal was to use ingredients that capture tuna’s good qualities without the bad. To that end, tahini and nutritional yeast are able to do an admirable job providing both nuttiness and umami. 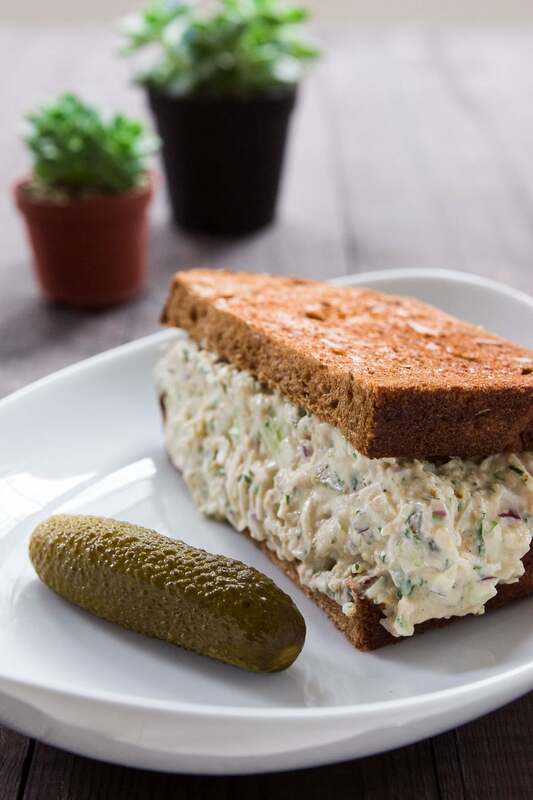 Together with all the other flavor and texture elements of a tuna salad, this plant-based sandwich is truly better than the original. Because this better “tunafish” salad keeps for a few days, you can help stick to your “bring lunch from home” resolution by keeping a bowl in the fridge so that making lunch is as simple as slathering a thick layer of it between two slices of bread. For the vegan mayo, there are a few brands of plant-based mayonnaise in stores now, or you can also make your own using my vegan mayonnaise recipe. Add the coconut to a pot along with a cup of water. Cook the coconut for 30-40 minutes, or until it is no longer tough and dry. Add more water if needed. Drain well. 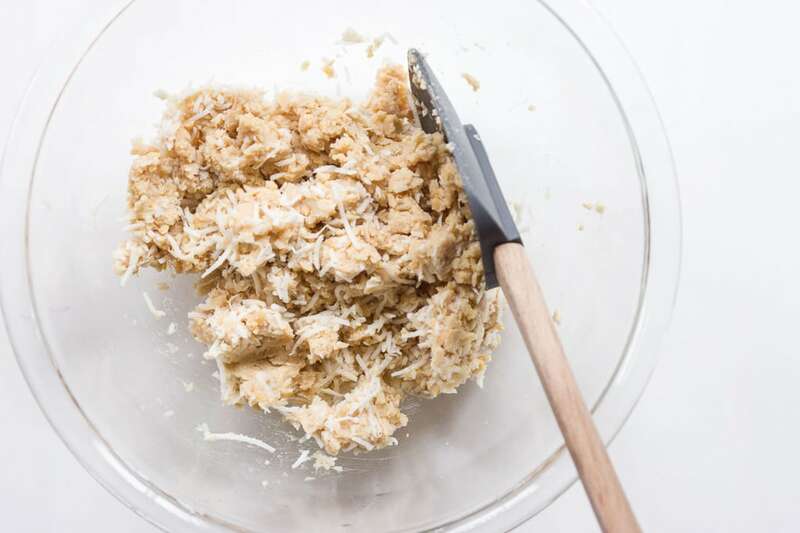 Add the cooked coconut and drained chickpeas to a food processor and pulse a few times until the chickpeas are chopped up into crumbles but not so long that it turns into a paste. You can also use a potato masher. You’re a genius! Clever use of the coconut. I added umami seasoning (trader joes) and salt to the coconut cooking and it made it a bit more ‘fish’ like for those vegans not looking to avoid the taste of tuna. Cool idea, I’ve never tried their Umami seasoning, what’s in it?